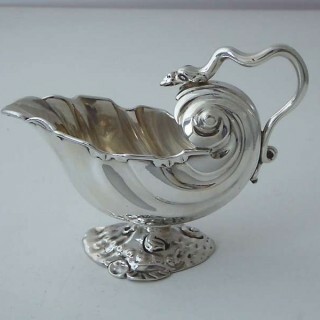 A rococo sauce boat of shell form with snake handle on a single ‘rocaille’ foot, made in London in 1747. 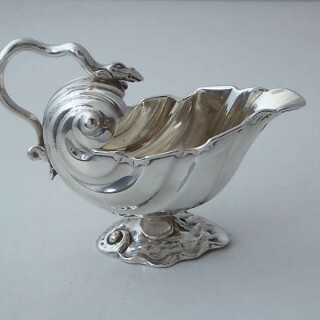 Although this piece carries no maker’s mark, stylistic features suggest that it was probably made by Nicholas Sprimont (active as a silversmith 1743-47) or a close associate. It is identical to a pair hallmarked 1761 in the Ashmolean museum, by William Robertson of London (see item 158 of Timothy Schroder’s “British and Continental Gold and Silver in the Ashmolean Museum” , pp. 406-407). Schroder states of the Robertson pair, that ‘the design follows one established in the mid-1740s by Paul Crespin and Nicholas Sprimont… [and that] … a similar model (inverted) was used by De Lamerie for a distinctive salt-cellar design of 1739’. William Robertson, of whom very little is known, is not recorded as registering his first mark until 1753 and so is unlikely to have made this . This sauce-boat is in excellent condition with good colour and no dings, scratches or other blemishes. 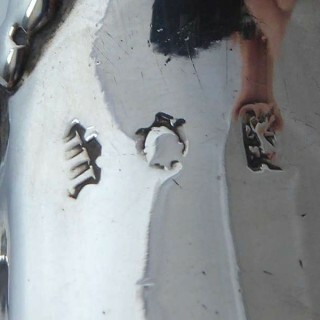 Though there is wear to the silver marks, the date letter and sterling lion are clear. Sadly, the space left for the maker’s mark has been left vacant.